Mid-Autumn Festival or Mooncake Festival is celebrated on the 15th day of the eighth month in the lunar calendar. 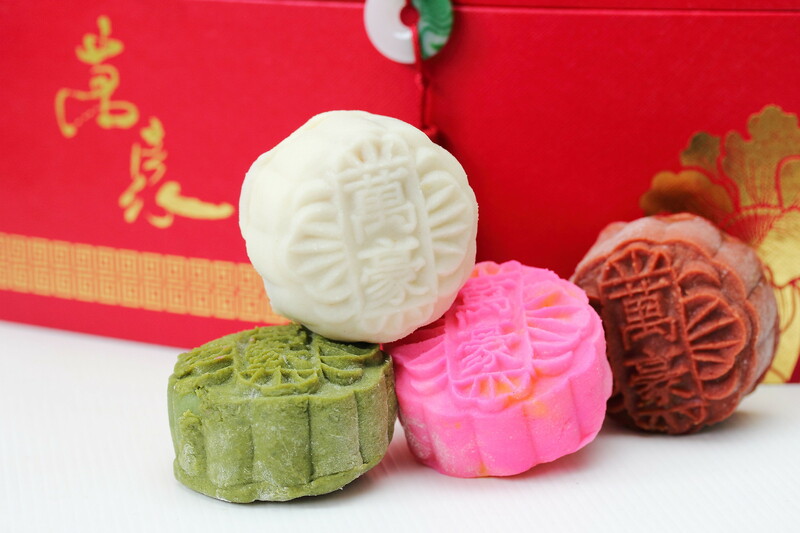 During the period leading to the festival, many restaurants and hotels will be coming out with various creations of the baked and snowskin mooncakes. There are so many different creations and packagings this festival season. I have put together a guide for your reference if you are thinking of getting some mooncakes for with own consumption or as gift to friends, families or business partners. Yan Ting at The St. Regis Singapore presents exquisitely handcrafted snowskin mooncakes with fresh flavours like White Lotus Paste with Lemon Truffle Snowskin Mooncake, Cranberry Paste with Salted Egg Yolk Snowskin Mooncake, White Lotus Paste with Lychee Martini Truffle Snowskin Mooncake and Black Sesame Paste with Melon Seeds Snowskin Mooncake. Back in popular demand is the Pure Mao Shan Wang Durian Indulgence Snowskin Mooncake. 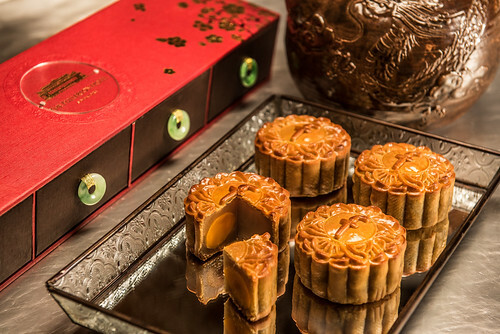 The baked mooncakes include signatures Baked Mooncake with White Lotus Paste and Single or Double Egg Yolks, Reduced Sugar White Lotus Paste with Macadamia Nuts Baked Mooncake and White Lotus Paste with Assorted Nuts and Yunnan Ham Baked Mooncake. Yan Ting's mooncakes will be available at Yan Ting Restaurant (Level 1U) and La Patisserie (Lobby Level), from 15 August to 27 September 2015. Enjoy Early Bird Special at a reduction of 5% from now till 8 September 2015. 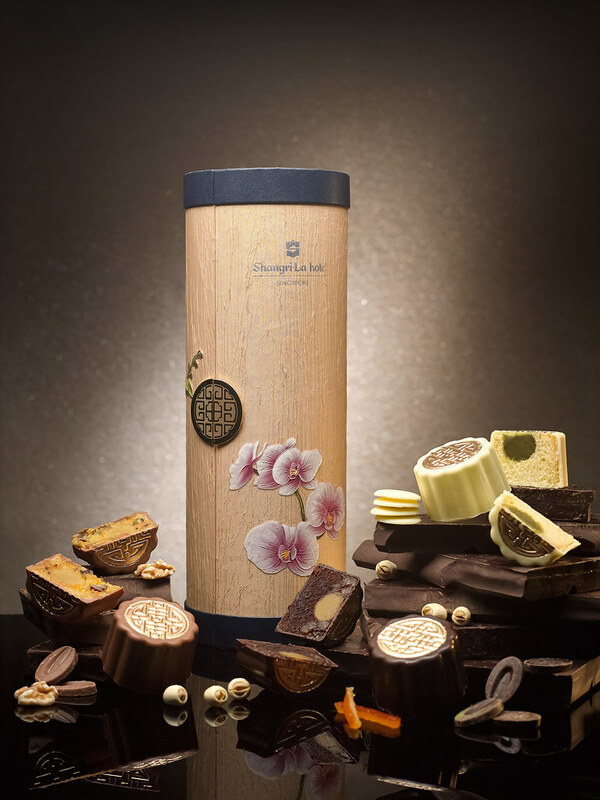 Shang Place at Shangri-La Singapore celebrates Mid-Autumn Festival with a uniquely luxurious chocolate trilogy mooncake collection. The Chocolate Trilogy mooncake collection, which pairs perfectly with champagne, combines a fine layer of chocolate enveloping lotus seed paste and other oriental ingredients. The three flavours featured are Dark Chocolate with Lotus Seed Paste and Candied Orange, Milk Chocolate with Lotus Seed Paste, Mixed Nuts, Pumpkin and Melon Seeds and Carrot, as well as White Chocolate with Lotus Seed Paste, Green Tea and Coconut. Fans of the baked variety will enjoy three refreshingly innovative mooncake flavours: Baked Salted Green Bean Paste Mooncake with Coconut, Mini Baked Salted Kumquat Mooncake with Egg Yolk and Mini Baked Custard Mooncake. 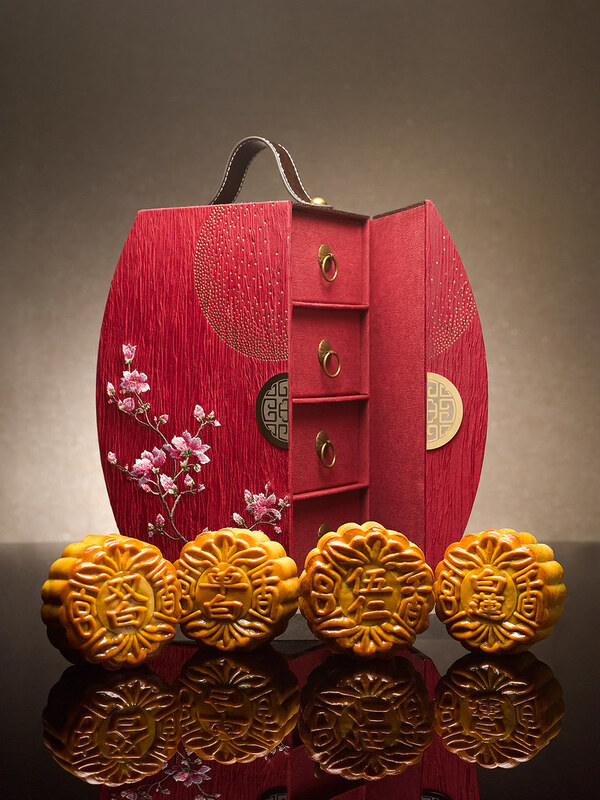 All mooncakes are presented in customised satin boxes with elegant peach-blossom embroidery. In addition to the new flavours, Shang Palace’s menu offers choices for guests who prefer the traditional baked combination of glistening Salted Egg Yolks Ensconced In Sweet White Lotus Seed Paste. Variations with four, double and single yolk are available. 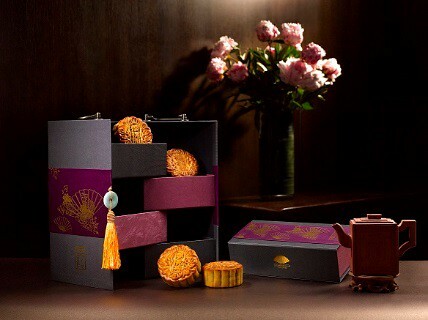 Guests may purchase Shang Palace’s mooncakes at the lobby of Shangri-La Hotel, Singapore from 17 August to 27 September 2015 and at retail booths located at shopping malls island-wide, including Takashimaya, VivoCity, Jurong Point and Parkway Parade, to name a few. For enquiries and orders, please call (65) 6213 4511 or email dining.sls@shangri-la.com. Paying tribute to our nation during this exceptional SG50 year, award-winning Masterchef Lap Fai from Hua Ting Restaurant has specially put together new mooncake creations to commemorate Mid-Autumn Festival and Singapore’s 50 years of independence. Masterchef Lap Fai and his talented culinary team have crafted two new snow skin mooncake flavours with tantalising local twists: Mini Snow Skin Avocado with Almond Flakes and Golden SG50 Mini Snow Skin Red/White Twist. Featuring Hua Ting’s perennial favourites – traditional baked mooncakes: White Lotus Paste with Macadamia Nuts, Seeds of Harmony (Assorted Nuts), White Lotus Paste Double Yolk with Macadamia Nuts, White Lotus Paste Single Yolk with Macadamia Nuts and Lotus Paste Single Yolk with Macadamia Nuts. 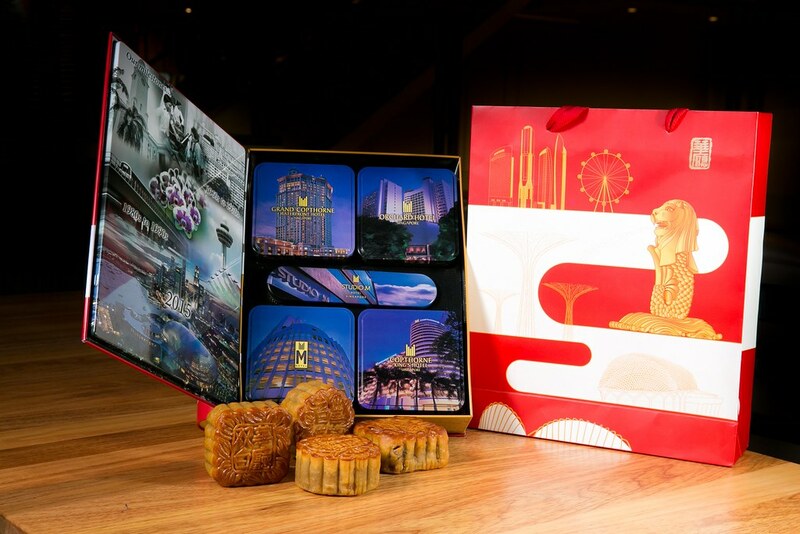 Millennium Mooncakes by Hua Ting will be on display and available daily for sampling at the mooncake booth located in Orchard Hotel Lobby from 21 August to 27 September 2015, 12:00pm to 8:00pm. Tea connoisseurs will delight in the new mini snowskin mooncake introductions that are filled with a delectably smooth and fragrant tea-infused lotus seed paste centre - specially customised Regent Blend tea (Darjeeling and Jasmine tea) and premium 18-year-old Pu’er tea, respectively. Regent Blend Tea with Lemon Paste is a harmonious pairing of refreshingly sweet and tangy notes while the Pu’er Tea with Red Dates delivers pleasantly complementary complex and earthy flavours. Not to be missed as well are their signature snowskin selections –Black Sesame Paste with Melon Seeds, refreshing Granny Smith with Lemongrass Chocolate, fragrant Green Tea with Melon Seeds, the classic White Lotus Paste with Yolk and Melon Seeds and our bestseller, Durian. Indulge, too, in their well-loved baked classics such as the Parma Ham and Pork Floss with Assorted Nuts. From now until August 25, 2015, all 4 or 8-piece mooncake box purchases are entitled to a 25 percent Early Bird discount. Regular orders from August 26 to September 27, 2015 will enjoy a 15 percent discount with the following credit cards: Amex, ANZ, Bank of China, CIMB, Citibank, DBS, Diners Club, HSBC, JCB, Maybank, OCBC, POSB, Standard Chartered and UOB. This year, Cherry Garden introduces the chef’s signature Pecan Maple Praline Mooncake, the perfect baked combination of sweet and crunchy nuttiness, paired with the light fragrance of smooth lotus paste. For a healthier selection, Cherry Garden showcases a delectable range of baked classics; such as the traditional mooncake with Low Sugar Silver Lotus Paste and Double Yolk, traditional mooncake with Low Sugar Silver Lotus Paste and Single Yolk, and traditional mooncake with Low Sugar Silver Lotus Paste and Macadamia Nuts. Headlining the premium snow skin selection is the new Charcoal Snow Skin Mooncake with Truffle Oil Lotus Paste and Egg Yolk. Back by popular demand, Cherry Garden’s much-loved snow skin mooncake with Lychee Martini Chocolate Truffle will also be available. Every piece of mooncake is prepared by our own chefs with the finest ingredients, delicately made to perfection, and exquisitely crafted to an intricate finish. 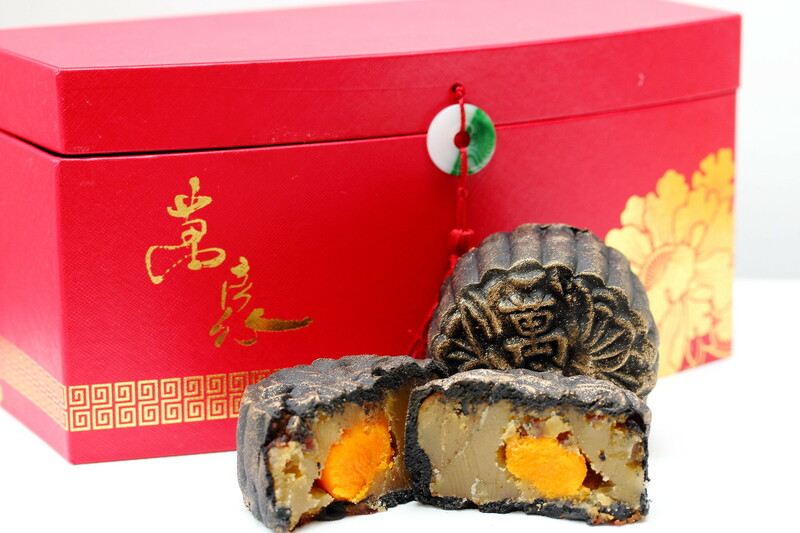 Please call 6885 3081 or e-mail mosin-mooncakes@mohg.com for mooncake orders or further enquiries. For the first time in Goodwood Park Hotel'ss history, the chefs have introduced a duo of baked mooncakes featuring two tropical fruit kings! 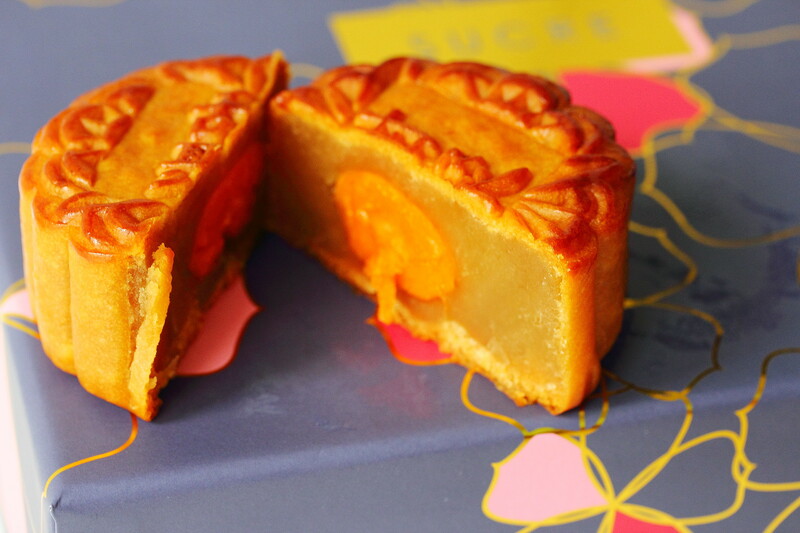 Aptly named Tropical Royals, one mooncake is a decadent mix of pure D24 durian pulp with white lotus seed paste, while the other features bits of the largest tree fruit – jackfruit – embedded in white lotus seed paste. 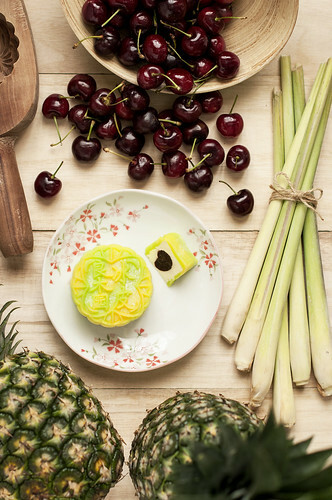 The brand new Pineapple, Lemongrass and Dark Cherry Snowskin Mooncake is an elegant creation that is perfect to enjoy in our tropical weather. 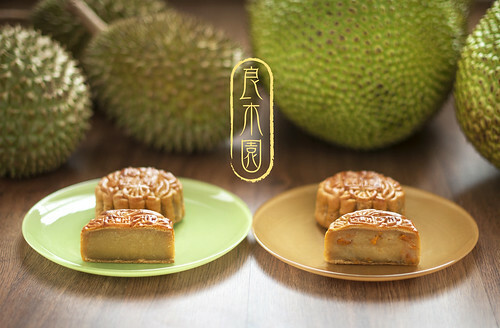 In addition, loyal durian aficionados can look forward to the hotel’s ever-popular Premium Durian Snowskin Combo comprising a quartet of mooncakes; each with a filling made from the fresh pulp of four types of durian. Last year’s wildly sought-after Black Thorn Durian Snowskin Mooncake makes a return as well. The all-time favourite baked varieties and fruity snowskin collection are also in the line-up. 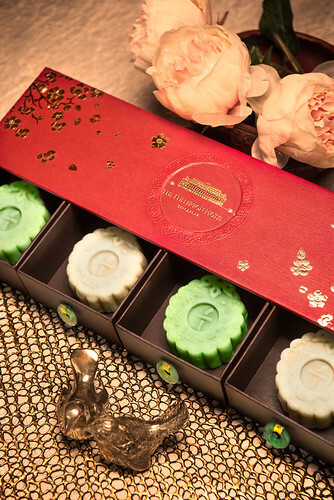 Available from 16 August to 27 September 2015, these irresistible mooncakes are presented in new green, yellow and gold packaging adorned with delicate floral motifs that speak of beauty and subtle elegance. To order, guests may visit the Deli from 9am to 9pm daily, contact the Mooncake Call Centre at (65) 6730 1867 / 1868 from 9am to 7pm (Mondays to Fridays) and 9am to 1pm (Saturdays, Sundays and public holidays) or email the order form (available at the hotel or at www.goodwoodparkhotel.com) to: mooncake@goodwoodparkhotel.com. Alternatively, guests can also place orders online at festivepromotions.goodwoodparkhotel.com. Last pre-order date is 21 September 2015, 5pm. Baked skin mooncake and traditional flavor lovers will enjoy Four Seasons' signature Silver Lotus Paste with Single/Double Yolk and Melon Seeds as well as Silver Lotus Paste with Honey and Pine Nuts. A new limited edition baked skin offering is the Charcoal Roasted Oolong Tea Mooncake. Another new flavour is the Milk Tea and Red Dates with Melon Seeds Mooncake which offers a sweet oriental taste with generous portions of red dates that can be seen with each bite. Vanilla Latte Paste Mooncake is a delectable option for baked skin mooncake lovers with a sweet tooth, while a previous favourite from last year, Assorted Nuts with Kaffir Lime and BBQ Chicken provides a savoury and rich option with a burst of flavors. The crowning jewel this year is the SG50 Singapore Sangria Mooncake, a limited edition snowskin mooncake specially created in celebration of the nation's Golden Jubilee. 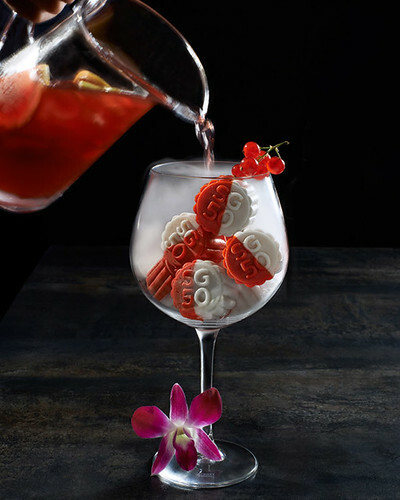 Infused with the signature Singapore Sangria cocktail, this mooncake is visually stunning with its red and white exterior embossed with the words "SG50". Call (65) 6831 7220 or email jnc.sin@fourseasons.com for orders, and spend a delectable and beautiful Mid-Autumn festival this year with loved ones. 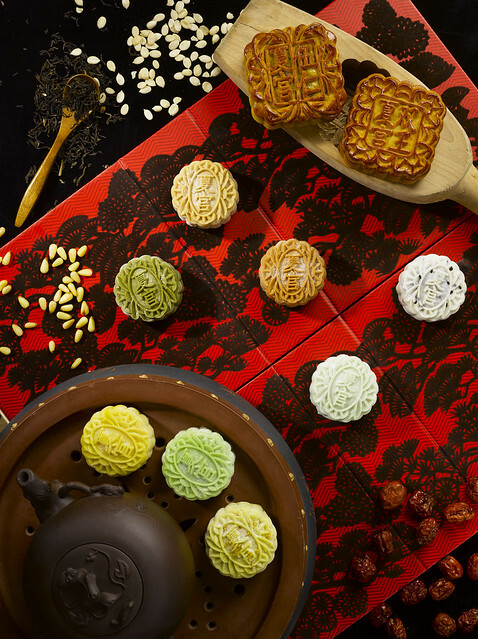 Celebrate this Mid-Autumn Festival with The Fullerton Hotel Singapore’s exquisite collection of mooncake treasures available in traditional and delectable local flavours. 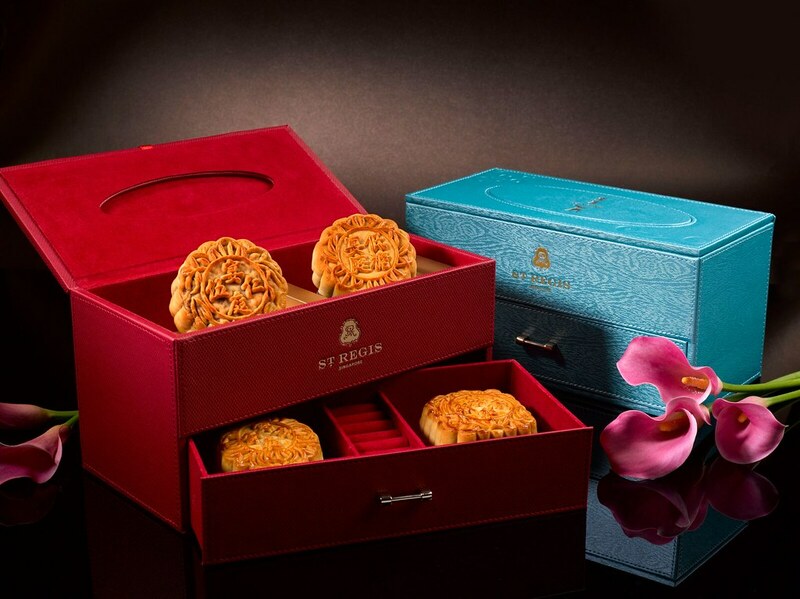 The mooncakes are encased in an exquisite box in vibrant red adorned with beautiful plum blossoms motifs that makes a great gift for this joyous occasion. Our fine selection of mooncakes is available from 13 August to 27 September 2015. Popular favourites returning this year is The Fullerton Snow Skin Treasures which offers a contemporary take on the classics. Three irresistible Snow Skin flavours exude a comforting taste of home with a dose of indulgence. The White Lotus Seed Paste with Egg Yolk Snow Skin Mooncake features a smooth and delightfully sweet white lotus seed paste while the Pandan with Gula Melaka Snow Skin Mooncake, a perennial favourite, is a divine blend of pandan and the deep caramel flavour of palm sugar. 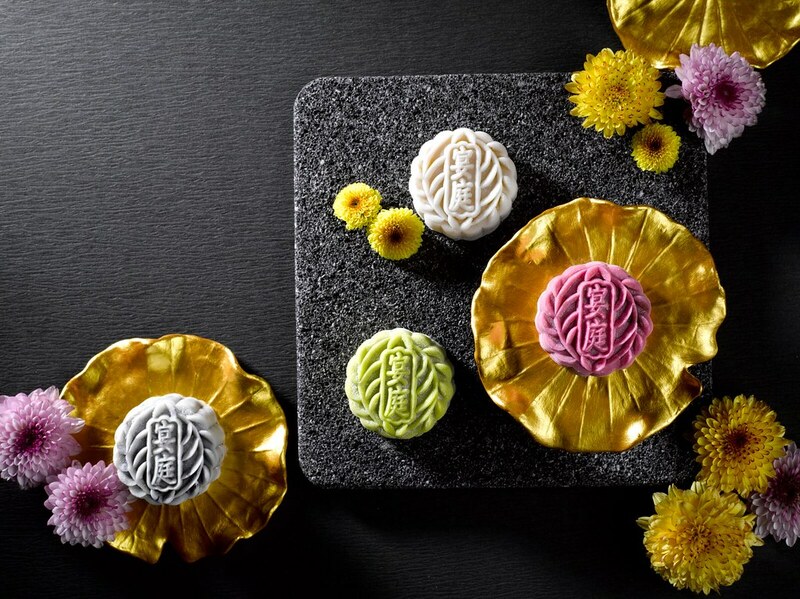 In addition, Jade restaurant is pleased to unveil its new creation for this year’s Mid-Autumn Festival, the Green Bean with Sweet Potato and White Lotus Seed Paste Snow Skin Mooncake that is inspired by the local dessert which has been enjoyed for generations. Wrapped in a pleasing pastel orange velvety snow skin complemented with an aromatic green bean and sweet potato that provides the right balance of sweetness. These Mid-Autumn treasures are available from 13 August to 27 September 2015 at The Fullerton Cake Boutique located on the lobby level of The Fullerton Hotel. To order, please call (65) 6877 8943 or email fullertonshop@fullertonhotel.com. Mid-Autumn Festival 2015 arrives at SUCRE with the Fleurs d’Automne mooncake gift set, which is available from July to September 2015. This year’s highlight flavour is the auspicious-sounding ‘Phoenix’, another perennial favourite with a twist – White Lotus Seed Paste with Pineapple and Single Yolk. 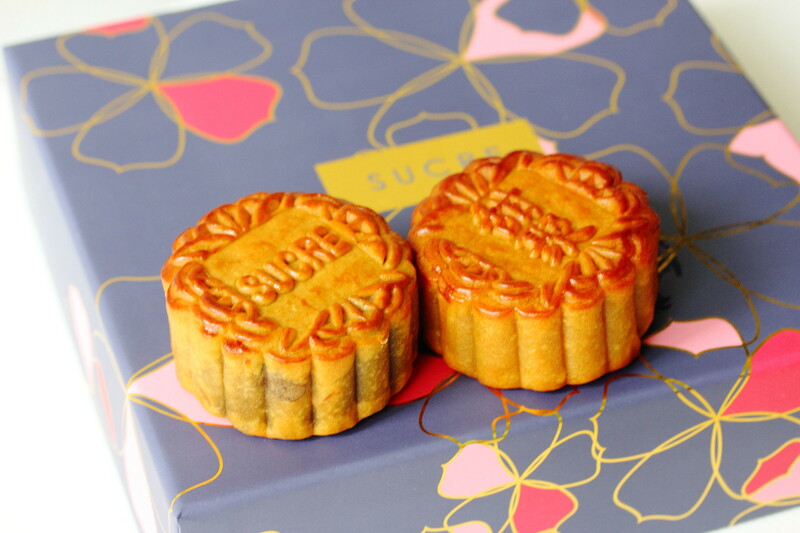 For traditional baked mooncake purists, SUCRE has included in this year’s offerings the following: White Lotus Seed Paste with Melon Seeds, White Lotus Seed with Single/Double Yolks, and Mixed Nuts. 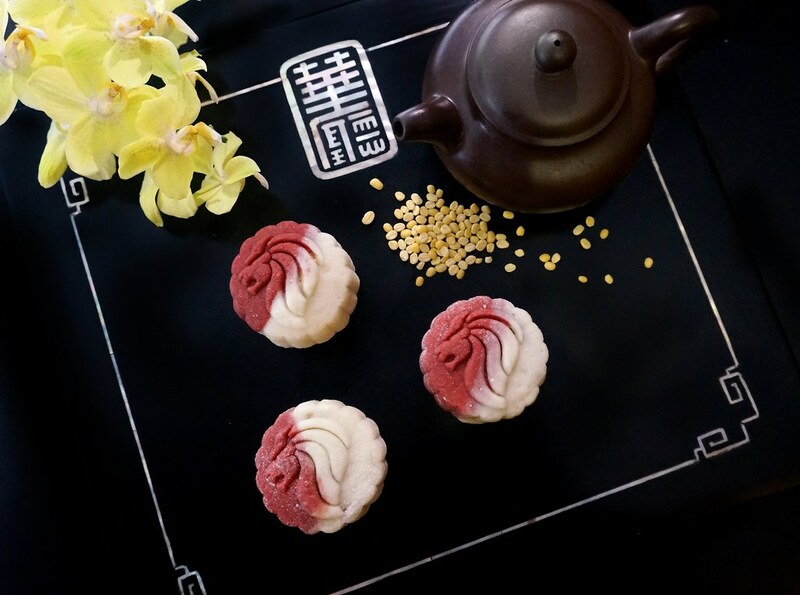 The artisanal brand will also introduce 2 new unique tea-flavoured mooncakes – White Lotus Seed Paste with a blend of Oolong & Pu-er Tea and White Lotus Seed Paste with Oolong Tea and Osmanthus Flowers. 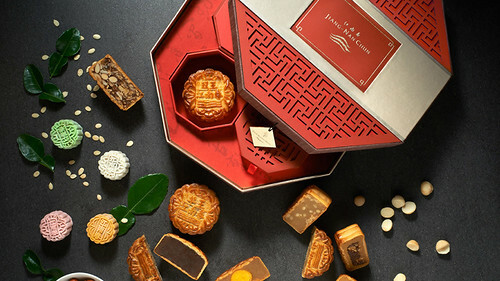 From September 14 to 27, SUCRE’s Fleurs d’Automne mooncake gift sets and artisanal cookies will be on sale at the Mid-Autumn Festival Fairs at JEM Shopping Mall and Parkway Parade Shopping Centre. The gift sets are also available for purchase online at www.ruedusucre.com from July 20. SUCRE artisanal cookies are also currently retailing at Naiise, Clarke Quay Central Shopping Mall, #02-23, 6 Eu Tong Sen Street, Singapore 059817. For more information and to place orders, please visit www.ruedusucre.com, email order@ruedusucre.com or contact SUCRE hotline at +65 6680 0295. Making a debut this year is the luxurious, gold-dusted Black Truffle, Roasted Chestnut, Waxed Duck and Single Yolk with White Lotus Seed Paste Baked Mooncake - the ultimate ensemble for the most exquisite palate. Another interesting baked mooncake creation is the spicy Jalapeno and Chicken Bak-Kwah with White Lotus Seed Paste Baked Mooncake. If you are a fan of bak-kwah, the signature White lotus Seed Paste with Chicken Bak-Kwah and Assorted Nuts Baked Mooncake is a must-try. Other crowd pleasers comprise of White Lotus Seed Paste with Single/Double Yolk, or with Pine Nuts or Macadamia Nuts. Snowskin mooncakes have been crowd-pleasers for its interesting and exotic mooncake flavours. In the spotlight are the refreshing Sour Plum with Portuguese Custard and Lime Puree Snowskin Mooncake and SG50-inspired Teh Tarik with Chocolate Pearls Snowskin Mooncake. Another all-time favourite is the Pure ‘Mao Shan Wang’ Top Grade Durian Snowskin Mooncake. Available from 21 August to 27 September 2015, Wan Hao’s mooncakes are available at the hotel’s Forecourt Stall and various shopping malls. 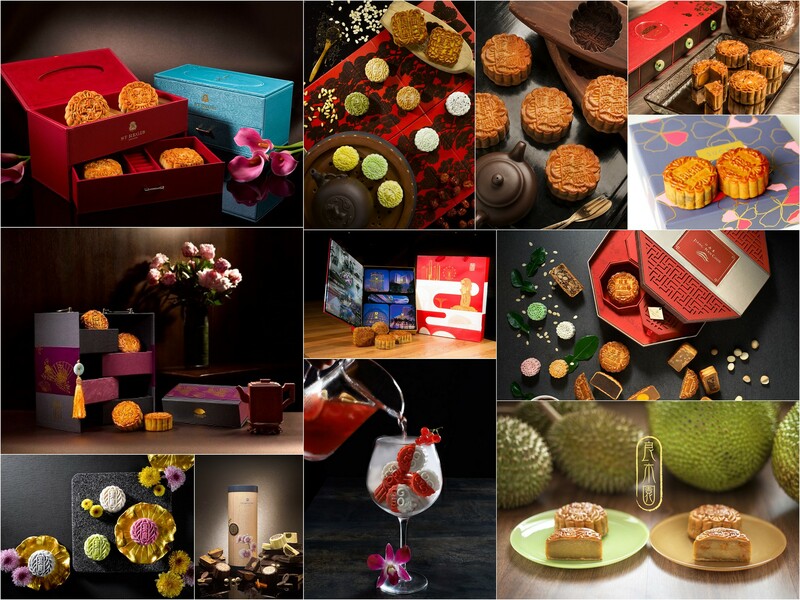 For orders or enquiries, visit www.singaporemarriott.com/mooncakes or call 6831 4708.